With constantly changing customer and market dynamics, hiring and retaining right fit talent is a key focus for organizations looking to leapfrog their competition. However, according to a research from CIPD in partnership with Hays group, four out of five organizations say that the competition for well qualified talent has increased over the last two years. At the same time, technology is playing a pivotal role in redefining the workforce landscape, by making it more mobile, globally accessible and diverse than ever before. Organizations across various sectors are acknowledging the need to stay competitive by ensuring that various business processes like HR, payroll and talent management are effectively managed. According to the report, by 2020, 30% of global midmarket and large enterprises will have invested in a cloud-deployed HCM suite for administrative HR and talent management. User friendly – does not require IT involvement to configure organizational charts, perform workforce modelling etc. Equipped with integrated hire-to-retire talent management capability, Oracle HCM is an agile, workflow-driven human capital management solution. It can be easily tailored to customize or add talent modules, depending upon the requirement, enabling cost synergies with a pay per use model. Access to real-time business insights such as turnover trends, factors driving employee retention, and best sources to hire the right talent are offered through the HCM dashboard. It also helps benchmark the compensation structure of the company, across the industry. As an integrated suite of offerings, Oracle HCM cloud drives global compliance, besides multi-lingual and multi-currency support. It also offers dynamic support to address any regulatory, organizational, and business changes, helping businesses stay compliant at all times. A unified cloud solution, it offers on-demand scalability with the guidance to move from tactical to strategic talent management. According to a study, 43% of CEOs indicated that investing in HR as a whole was a high priority, with 71% identifying human capital as a top contributing factor for creating sustainable economic value. 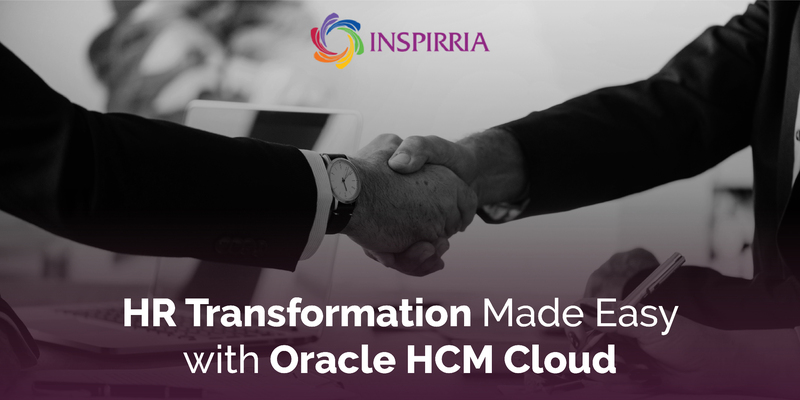 Inspirria Cloudtech has extensive experience in helping global organizations streamline their core HR processes by integrating Oracle HCM into their business processes, thereby eliminating waste and increasing staff productivity. Inspirria is a leading Oracle HCM provider, offering end-to-end implementation services and support to cater to the dynamic growth requirements of organizations. Leveraging more than 14 years of experience in cloud technologies, we help companies deploy Oracle HCM cloud platform to transform their talent management processes and operations, driving superior business value and improved ROI.